Spent a bit of time in the South End on Saturday with Pyles, Farrah, and Barry. It’s a funny thing: the South End is one part of town I just don’t really ever spend any time in. Not sure why. In fact, I can’t remember the last time I was there. Thankfully, we picked a great day weather-wise to take it in. And it was cool because I finally went to places that had been recommended to me for a while. 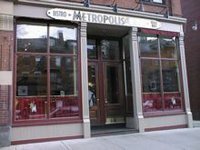 For example, our first stop was brunch at Metropolis Café. In a word: Yum. Good pancakes and eggs. Of course, I was really torn betwen that (aka: the Metropolis Breakfast) and the cinnamon brioche french toast, so I’ll definitely have to go back soon to try the other dish. Now granted, no other brunch place could ever compare to Johnny’s Luncheonette in Newton Center (I take my brunch seriously — more on that in another posting eventually), but it’s nice to have other good places to go. No one wants to see all this poo! And I’ll remove these poems from view. It reminded me that unlike some other parts of town, the South End is a real neighborhood. There’s a community feel to the area, no doubt due partly to the small gardens and communal gathering areas (and on other streets, the rainbow flags). I don’t think you could get away with posting that sign on multiple poles on my street — much less one pole. I know the contents of this entry must not be news to most folks, but for me it sort of was. I’ve often been accused of spending too much time in my Green Line-centered world. I mean, I’m not the world’s biggest Cambridge or Somerville fan (thus, why I didn’t write up my afternoon spent in Central Square last weekend), but the South End is somewhere I could learn to enjoy. There are just too many good restaurants and too much nice architecture to overlook it in my wanderings around the city. And I know I just skimmed the surface on Saturday. So I hope to get back over there to explore the area some more (and try out the french toast and chocolate cake) real soon.